Birth. 1360/1370, Ischia, Naples. 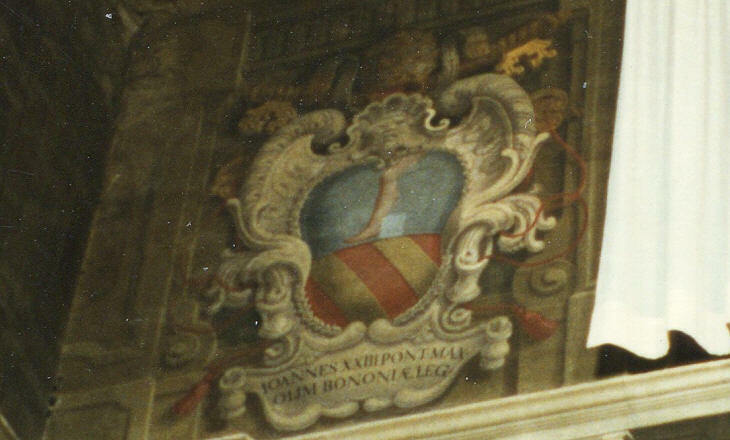 Son of Giovanni Cossa, signore of the isle of Procida, and Cicciola Barile. He had three brothers. The family had a reputation as pirates. His first name is also listed as Baldassarre and his last name as Coscia. Distant relative of Pope Bonifacius IV on his mother's side. Education. Studied theology in Rome; obtained a doctorate in law at the University of Bologna shortly before 1389. Early life. Canon of the cathedral chapter of Bologna by 1386. Papal chamberlain in 1392. Archdeacon of Bologna in 1396. Protonotary apostolic. Auditor of the Sacred Roman Rota. Cardinalate. Created cardinal deacon of S. Eustachio in the consistory of February 27, 1402. Named legate in Romagna, he left Rome March 17, 1403; he was charged with the recovering the city that was under the Visconti; the cardinal took control of the city in September 1403; Popes Innocent VII and Gregory XII confirmed his legation; later, in 1408, he was deprived of the legation by Pope Gregory XII; Antipope Alexander V reestablished his legation and named him vicar of Bologna. Did not participate in the conclaves of 1404 and 1406, which elected Popes Innocent VII and Gregory XII respectively. In 1408, he abandoned the obedience of Pope Gregory XII, taking with him in his defection many other cardinals, prelates and private persons. He worked strenuously for the celebration of a council in Pisa, which took place in March 1409; he was the grand elector in the conclave that followed the deposition of Pope Gregory XII and Antipope Benedict XIII by the council. Took part in the election of Antipope Alexander V on June 26, 1409. He left Pisa on July 11, 1409 and returned the following August 8. The new antipope was not able to enter Rome because of the support of Ladislas of Durazzo for Pope Gregory XII; in opposition to Ladislas, Pisa supported Louis II of Anjou as king of Naples; Cardinal Cossa led the battle against Ladislas and entered Rome in October 1409; after his victory, he returned home to Bologna; Antipope Alexander V joined him in Bologna; on December 26, Cardinal Cossa entered Pistoia, where the curia was. Antipope Alexander V died in Bologna of natural causes on May 3, 1410. Participated in the conclave of 1410 and was elected antipope. Antipapcy. Elected antipope on May 17, 1410 in Bologna. Took the name John XXIII (1). Priesthood. Ordained on Saturday May 24, 1410 in the Apostolic Palace in Bologna. Episcopate. Consecrated, Sunday May 25, 1410 in the cathedral of S. Petronio, Bologna, by Cardinal Jean Franczon Allarmet de Brogny, bishop of Ostia and Velletri, dean of the Sacred College of Cardinals and vice-chancellor of the Holy Roman Church. Crowned on the same day in front of the door of the catedral of Bologna by Rinaldo Brancacci, protodeacon of Ss. Vito e Modesto. After Ladislas of Durazzo retook Rome, Antipope John XXIII headed a military operation and entered Rome on April 12, 1411; to remain in the city, he negotiated a peace with Ladislas in June 1412. He called a council in Rome for the reform of the church but it received very little support and was ended in March 1413. He sought refuge in Florence after the occupation of Rome by Ladislas in July 1413. King Sigismund of the Romans, future emperor, who supported Pope Gregory XII, proposed the calling of a general council to end the schism; Antipope John XXIII, who was in weakened position, had to agree and issued a bull of convocation on December 9, 1413; even before the papal document had been issued, King Sigismund had produced an edict calling a council in Constance on November 1, 1414; the council opened on November 5, 1414. The Council of Constance asked the pope (Gregory XII) and the two antipopes (Benedict XIII and John XXIII) to abdicate; at first, Antipope John XXIII refused to abdicate; then, on March 2, 1415, he agreed to resign if Benedict XIII and Gregory XII did resign as well; on March 19, he escaped from Constance in disguise as a postman; he sought refuge in Schaffousen protected by Duke Friedrich of Austria. When King Sigismund threatened him, the antipope tried to escape crossing Rhine; this move made the antipope lose credibility before the council fathers, who declared the superiority of the council over the pope; a summons was issued for Antipope John XXIII to appear before the council; he received the summons in Freiburg; King Sigismund conviced Duke Friedrich of Austria to give him control over the city, and the antipope was arrested and imprisoned in Randolfzell; accused of ambition, simony, bad conduct, and tyranny, he was tried by the council fathers and deposed on May 29, 1415. He was imprisoned in the castle of Radolfzell on Lake Constance and was freed in June 1419 by the payment of a hefty ransom. After his release, he made his submission to Pope Martin V, who absolved him and named him cardinal bishop. During his pontificate, he had created eighteen pseudocardinals in four consistories. Cardinalate. Created cardinal bishop of Frascati in the consistory of June 23, 1419. Death. December 22, 1419. Buried in the baptistery of the metropolitan cathedral of Florence. 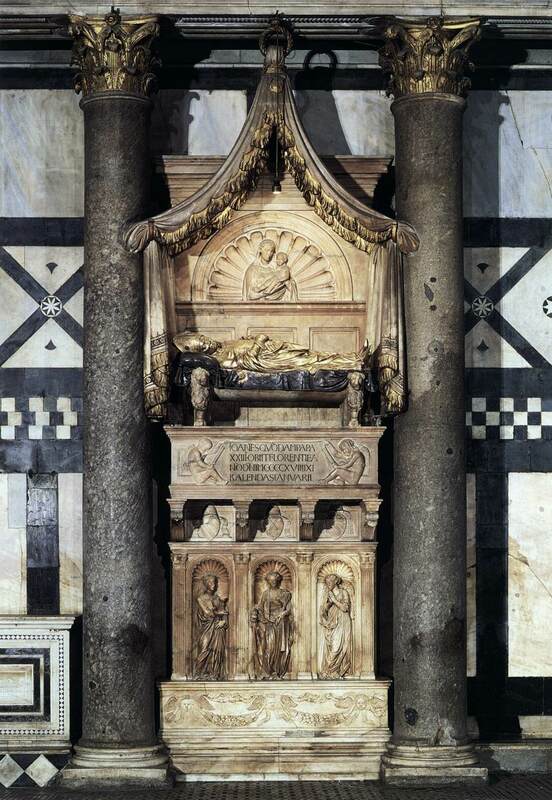 His funeral monument, ordered by Cosmo de' Medici, was built by Donatello de' Bardi, Michelozzo di Bartolomeo and Pagno di Zapo Portigiani (2). Bibliography. Cardella, Lorenzo. Memorie storiche de' cardinali della Santa Romana Chiesa. Rome : Stamperia Pagliarini, 1793, II, 318-320; and III, 1-26; Chacón, Alfonso. Vitæ, et res gestæ Pontificvm Romanorum et S. R. E. Cardinalivm ab initio nascentis Ecclesiæ vsque ad Vrbanvm VIII. Pont. Max. 2 volumes. Romae : Typis Vaticanis, 1630, II, col. 710 and 785-810; Del Re, Niccolò. "Giovanni XXIII, antipapa." Mondo vaticano. Passato e presente. Città del Vaticano : Libreria Editrice Vaticana, 1995, p. 645-646; "Essai de liste générale des cardinaux. VII. Les cardinaux du Grand Schisme (1378-1417)". Annuaire Pontifical Catholique 1931. Paris : Maison de la Bonne Presse, 1931, p. 138; Eubel, Conradus and Gulik, Guglielmus van. Hierarchia Catholica Medii Aevi. Volumen I (1198-1431). Münich : Sumptibus et Typis Librariae Regensbergianae, 1913; reprint, Padua : Il Messagero di S. Antonio, 1960, pp. 26 and 50; Eubel, Conradus and Gulik, Guglielmus van. Hierarchia Catholica Medii Aevi. Volumen II (1431-1503). Münich : Sumptibus et Typis Librariae Regensbergianae, 1914; reprint, Padua : Il Messagero di S. Antonio, 1960, pp. 5 and 61; Kelly, John Norman Davidson. The Oxford Dictionary of Popes. Oxford ; New York : Oxford University Press, 1986, pp. 237-239; Kitts, Eustace J. Pope John the Twenty-Third and Master John Hus of Bohemia. London : Constable, 1910; Uginet, François-Charles. "Giovanni XXIII, antipapa." Enciclopedia dei papi. 3 vols. Roma : Istituto della Enciclopedia italiana, 2000, II, 614-618. Webgraphy. Biography by Giovanni Battista Picotti, in Italian, Enciclopedia Italiana (1933), Treccani; biography by Johann Peter Kirsch, in English, The Catholic Encyclopedia; biography by José Goñi Gaztambide, in Spanish, Gran Enciclopedia Rialp, 1991; biography, in English, Encyclopaedia Britannica; his portrait and arms, secolo XVIII (1790-1810), ambito laziale, regione ecclesiastica Lazio, diocesi Frascati, Beni Ecclesiastici in web, (BeWeB); biography, in Italian, diocesi di Frascati; his arms and engraving, Araldica Vaticana; his arms, Palazzo Comunale di Bologna, Rome Art Lover; his tomb in the baptistery of the metropolitan cathedral of Florence, Web Gallery of Art. (1) On October 28, 1958, Cardinal Angelo Giuseppe Roncalli, patriarch of Venice, was elected to the papacy and took the name John XXIII because Antipope John XXIII, Baldassare Cossa, is not considered a legitimate pope and, therefore, does not count in the papal chronology.